Harris gave guitar lessons and performed in musical groups before he formed the duo Once Blue with singer-songwriter Rebecca Martin. Once Blue released its self-titled debut on EMI Records in 1995 and nine additional songs were included in the album's re-release in 2003. Harris became a songwriter for Sony Publishing for a time and then made three self-released recordings with his new band, The Ferdinandos, consisting of Harris, Tony Scherr, Tim Luntzel, and Kenny Wollesen. The band released two more albums on Verve Records. 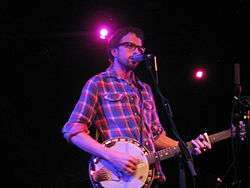 Harris recorded three solo albums Mineral, Feel, and Watching the Sky on his own label, Secret Sun Recordings. In 2003 he was awarded a Grammy Award for Song of the Year for "Don't Know Why," performed by Norah Jones. In 2007, Harris contributed songs to the soundtrack of the film The Hottest State. He also acted in the film and sang with Willie Nelson, Emmylou Harris, Feist, Cat Power, M. Ward and others singing the rest of Harris' compositions. His music has been described as a "blend [of] folk, rock, jazz, and world rhythms." Harris has toured throughout North America, South America, Australia, Europe and Japan and has been an opening act for Norah Jones, American Music Club, Bright Eyes, Joshua Radin, and Ani DiFranco. Harris was a judge for the 10th annual Independent Music Awards to support independent artists. In August 2010 Harris released his album Through the Night and recorded a new version of his song "The Secret Sun" for a Corona (beer) commercial. Harris' 11th album, Sub Rosa, was released in July 2012 and features guest vocals from Conor Oberst, Melody Gardot, and Norah Jones. Harris' 12th album, the stripped down Borne Away, was released on June 25, 2013. In 2016, he produced Julian Lage's album ARCLIGHT. John Zorn - The Song Project' (Tzadik, 2015); writing lyrics for various Zorn compositions and singing them with Marc Ribot, John Medeski, and Zorn conducting. 1 2 3 4 5 Jesse Harris biography. - MusicianGuide.com. ↑ "Marie Masters". TV.com. Retrieved 2013-03-29. ↑ Weiss, Rebecca (November 7, 2007). "The Cornell Connection: Jesse Harris '92 Grammy-Winner succeeds in life despite (or because of?) low GPA". The Cornell Daily Sun. Retrieved 2009-01-04. ↑ "Notable Cornell University Alumni: Music". Cornell University. Retrieved 2013-03-29. ↑ Johnson, Zac. "Jesse Harris - Music Biography, Credits and Discography". AllMusic. Retrieved 2013-03-29. 1 2 Soundtrack, Original. "'The Hottest State' Gets an All-Star Soundtrack". NPR. Retrieved 2013-03-29. ↑ Farber, Jim (August 5, 2007). "'State' of the art". Daily News. New York. Retrieved 2013-03-29. ↑ Gorce, Tammy La (2007-07-10). "Feel - Jesse Harris : Songs, Reviews, Credits, Awards". AllMusic. Retrieved 2013-03-29. ↑ "Independent Music Awards". Independent Music Awards. Retrieved 2013-03-29. ↑ Archived September 17, 2010, at the Wayback Machine. ↑ "Dangerbird Records store: Jesse Harris, Sub Rosa". Store.dangerbirdrecords.com. Retrieved 2013-03-29. ↑ Chris Rutledge (June 14, 2012). "Watch Two New Trailers For Jesse Harris' Sub Rosa". American Songwriter. Archived from the original on 2010-06-17. Retrieved 17 June 2012. ↑ "Bio + Press". www.jesseharrismusic.com. Retrieved 2016-04-14.